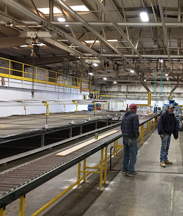 Employees inspect one of the production lines in the plant before the industry opens. DOUBLE SPRINGS - A $400,000 grant from the Alabama Department of Economic and Community Affairs will be the major kickoff of a new manufacturing business opening in Double Springs in the facilities vacated by the relocation of Southern Homes back in 2014. Winston Homebuilders, a subsidiary of Hamilton Homebuilders, has acquired the buildings on the 20 acres of property in the Double Springs Industrial Park through an eight year lease/purchase agreement with the town of Double Springs, said Mayor Elmo Robinson. The manufacturing operation plans to hire up to 150 to 170 local people in building both single and double wide homes. The number of employees was one of the key factors behind the town being able to obtain the $400,000 ADECA grant, which will be used toward refurbishing one of the long plant buildings that through the years has fallen into disrepair, officials said. “Back when we first originally bought the property, the oldest building out there completely needed new tin all the way around it and new lighting, doors and everything like that,” Mayor Robinson said. When the town contacted ADECA about financial assistance, ADECA informed them funding could not be made available until the town had a project going in the facility, the mayor added. Once the town leased the property to Winston Homebuilders, the town again talked with ADECA, at which time the town qualified for $400,000 for assistance in refurbishing the building, Robinson said. The grant will cover $400,000 of the estimated $1 million it will cost to furbish the oldest and most dilapidated of the buildings. Winston Homebuilders will be responsible for the remaining approximate $600,000 not covered by the grant, town officials said. The project will put new tin on the building as well as insulation, new doors as well as other improvements, officials indicated. Company officials said the building will get a complete overhaul. The town purchased the facilties and property formerly occupied by Southern Homes, thanks to a $530,000 Traders and Farmers Bank loan, town officials said. Four buildings total-- three used for manufacturing and one for office, were on the 20 acres of property. The town of Double Springs worked with the Industrial Development Authority of Winston County to help make Winston Homebuilders a reality in locating in Double Springs, Robinson indicated. “This is a real positive event for Winston County,” noted David Roberson, president of the IDAWC. “This is the first time we’ve been able to attract an employer into the area in quite a while. “We think in the long run, they will have a significant employment base,” he added. “They are going to pay very competitive wages. Another factor in the town of Double Springs receiving the $400,000 ADECA grant, was the town had to show the employees being hired to work were low to moderate income. “You have to hire several of the local income people in order to qualify,” Robinson said. The lease/purchase agreement with the town, means Winston Homebuilders has options in the future of purchasing the buildings and property from the town, the mayor said. If the company, for instance, leaves after eight years and has not exercised their right to purchase during any of that time, then the town takes back over the buildings and property, officials said. “It’s helping us with more options for people with employment,” Robinson said. “This company is paying a good salary, where we were looking for a company to come in, we didn’t want somebody who was just paying minimum wage. We wanted someone who was paying top wages,” the mayor added. “As far as the north Alabama average, they are paying higher than average,” he continued. Winston Homebuilders will be good for the local economy not only by pulling workers from the local area but also purchasing any materials or supplies they need from local businesses, the mayor noted. The payments the town receives through their lease/purchase agreement will go toward paying their loan, Robinson said. “We lack about seven years on the loan,” said Robinson, noting the payments no longer will have to come from the general fund. Mayor Robinson noted some people laughed at the town when they considered purchasing the property, but that purchase is paying dividends. “You have to step out and take a chance every once in a while to get anything,” the mayor said. “We purchased it with the idea of getting the best company we could in there paying the best salaries we could. We have done that with this company. “If you can come in with a good business plan and have a good track record in hiring a lot of employees, there’s a lot of benefit you can get through the state,” Robinson said. “But you can’t do that with 15 to 20 employees and no background in the business at all,” he added. Winston Homebuilders has been advertising for employees, and so far have received 600 applications. Application for employment can be found on Winston Homebuilders’ website at www.winstonhb.com. Greg Brown, general manager of Winston Homebuilders, noted the company had been looking to expand their product area. “When you’re looking for a plant to do manufactured housing, this place was already here. It had done it in the past,” said Brown. The plant was somewhat already set up for manufactured housing operations since Southern Homes had once located there, but Winston Homebuilders brought their own equipment and supplies to the area. They are also refurbishing the other manufacturing buildings on the site to make them ready for their own production lines, officials indicated. The company plans to build up its line, starting with 40 to 50 employees by the end of the first week, said Brown. The entire single wide or double wide home will be manufactured from start to finish as it transitions through different buildings on the site. Market for these homes will be throughout areas of the southeastern and southern midwest portions of the United States, said Brown. Winston Homebuilders plans to pull employment from Winston, Walker and Lawrence counties mainly, according to Brown. “We’re happy to be here,” he said. “We think it’s a good opportunity. It’s a win win for the community and for us. “We want to be good partners with the city, and they have been great partners to help us get started,” Brown said. State Senator Greg Reed worked with Governor Kay Ivey and State Representative Tracy Estes to help land the grant for the Town of Double Springs. Estes noted he was grateful to ADECA for their assistance in helping fund this project. “This partnership with the town of Double Springs will serve to bring new jobs to our area,” Estes said. “This was a team effort on behalf of Winston County, and I appreciate the work that Representative Estes, Mayor Elmo Robinson, David Roberson at the Industrial Development Authority and Keith Jones at the Council of Local Governments put in to make this grant a reality,” Reed continued. Estes commended Mayor Robinson and the town council for pursuing these ADECA funds. See complete story in the Northwest Alabamian.